The Collins model at Ronto’s Eleven Eleven Central has been sold. Shown is an artist’s conception of the Collins great room. Jinx McDonald Interior Designs has completed the preliminary design for the interior of the already sold furnished Collins model at Eleven Eleven Central, a new walkable/bikeable, access-controlled community to be built by the Ronto Group on Central Avenue between 10th Street and Goodlette-Frank Road in downtown Naples. Four furnished models, all under contract, will be included in the community’s Phase I building and showcase Ronto’s Collins, Belair, and Duval floor plans. The models will be available for viewing after completion of construction through a developer leaseback. Ronto anticipates beginning construction by the end of this year. 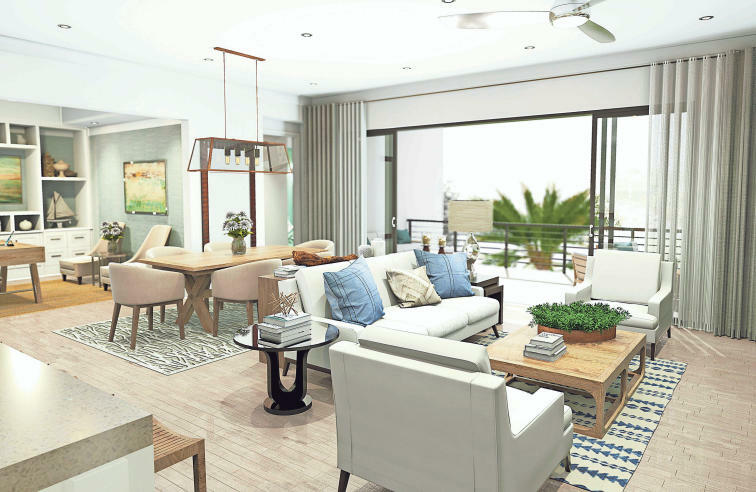 Phase I features 62 residences showcasing five light-filled two-bedroom, two-bedroom plus den, and three-bedroom open-concept floor plans ranging from 1,407 to 2,297 square feet of total living space, including covered outdoor balconies. Two of the floor plans, the Atlantic and the Avalon, are sold out. Preconstruction pricing on the remaining unsold residences starts at $725,000. Ronto anticipates beginning construction by the end of this year. Seven southern facing Collins residences, base priced at $820,000, are available for purchase with a neighborhood view. The two-bedroom plus den, two-and-a-half bath Collins plan includes 1,947 total square feet with 1,757 square feet under air. The living area opens to a covered balcony and includes a great room, dining area, and island kitchen. The owner’s suite features two walk-in closets, a bath with his and her vanities, and a bedroom with a sitting area. Five northern facing residences also remain, and are base priced at $945,000. Designers Minka McDonald, ASID, LEED AP, GREEN AP and Beth Walker-Fenton, ASID, and Design Assistant Courtney Chase created an interior with an urban resort feeling. The design’s soothing neutral color palette will feature layers of texture and include Extra White wall tones, creams, pewters, champagnes, and platinum with steel blue accents. Flooring in the living areas and on the balcony will be 30-by-30-inch creamy rectified porcelain tile. The design’s sophistication will be established in the foyer where a circular mirror with a silver frame and an entry chest with a bold sunburst motif on the ivory-toned door front will greet visitors. The frame and circular door pull on the entry chest will have an ebony finish. An antique silver pendant lighting fixture with circular elements around a globe-shaped light will add another touch of elegance. A custom wall treatment on the great room’s feature wall will provide a memory point. Flat stock in a dark, graphite toned finish will divide the wall into three panels. The center panel will be clad in a sparkling pearl colored mica wall covering. The television will be mounted on the mica covered wall. Below the center panel, a console with a black truffle frame and hammered silver door fronts will offer storage space. The flanking panels will have vertical and rectangular mirrors to enhance the feeling of the great room. Furnishings will include a sectional sofa and chaise with a java base and cream toned washable Crypton fabric. Accent pillows on the sofa will be champagne and pewter with a trellis motif. A silver finished cocktail table will be presented in two pieces that can be separated. An angular side chair will have a stainless-steel frame, a channeled back and base, and pearlescent faux ostrich leather. Between the side chair and the sectional will be a dual-finish end table 20-inches in diameter with a stainless-steel top and bottom with the top wrapped in a gray wood. The neutral grouping will be anchored by a steel blue area rug. The great room slider will be flanked by stationary drapery panels in an ivory, pewter, and champagne embroidered fabric. The adjacent dining area will feature a table with a Wenge crescent-shaped base and a glass top. Contemporary dining chairs will be finished in champagne leather with a stripe pattern and java frames. A 40.5-inch wide chandelier with milky glass squares framed in silver metal frames will be suspended over the dining table. In the kitchen, the island and perimeter cabinetry will have slab fronts in a Toronto graphite-toned finish against white quartz countertops. The backsplash will be fashioned from champagne glass tile run on the diagonal. Three contemporary adjustable height white leather swivel counter stools at the island will include a polished stainless-steel base and foot rest. The den will feature a wall unit that mimics the wall treatment in the great room. The den wall will be broken into three panels separated by flat stock with the mirror in the center panel and the mica wall covering on the flanking and lower panels. Sconces that are companion pieces to the dining area chandelier will be placed on the left and right mica covered panels. Two consoles in the Toronto graphite-toned finish will be placed beneath the three panels and have book shelves lined with books and accessories and two narrow drawers. The consoles will also serve as a device charging station. For relaxation, there will be two chaise lounges in a pearlescent velvet with a laser cut abstract pattern and rich dark frames. Two end tables with a gray Havana finish will provide a surface for a beverage or for writing while relaxing on the chaises. A pendant light fixture in a silver geometric pattern, an oversized silver mirror that mimics the mica wall covering, and an art piece in a steel blue color will complete the look. In the owner’s bedroom, the headboard wall will be clad in wallpaper in shades of ivory, cream, graphite and steel blue that create the look of an abstract water color landscape mural. The fully upholstered bed will be finished in a soft white linen look fabric and include a channeled headboard as well as walnut feet. The nightstands will feature a dark ceruse mink finish with silver detail striping and an inset glass top. A polished nickel architectural looking table lamp with interlocking squares will sit on each nightstand. The dresser will be in a matching finish. Additional furnishings will include a brushed stainless-steel base lounge chair with channeled platinum gray upholstery and two 76-inch tall vertical mirrors with silver leaf frames and a stylized rectangle within a rectangle shape broken at the top and bottom. In the owner’s bath, slab front touch-latch vanities will be finished in a dark tone and arctic white quartz countertops. Brushed nickel circular style lighting fixtures with candlestick lamps behind frosted glass will be mounted above the vanities. In the shower, the soft creamy beige porcelain flooring tile will run up the focal wall and include a mosaic detail.